Saturday, April 10, Brooklyn’s Boy Genius will return to New Haven to bring their brand of ’80s- and ’90s-inspired pop to Rudy’s. Boy Genius takes inspiration from bands such as R.E.M., Miracle Legion, Let’s Active and The Lemonheads, to name a few. The band’s latest offering, “Staggering,” has been getting rave reviews from pop bloggers around the world. Tread carefully ye who tar Boy Genius as the dreaded ‘college rock’, because there’s so much more to them and this wonderfully-crafted album than that. ‘Staggering’ has all the hallmarks of mid-90s American indie, but also draws heavily on bands like Go Betweens and Orange Juice and even early REM at times. I’m not one to call albums ‘classical’, but this is one that draws from just about every cool influence and mixes them up just about right. However, it’s neither a blind copy nor some kind of homage – more an amalgamation of your record collection. The Tyler Trudeau Attempt are a New Haven staple with a catchy power-pop sound and lyrics you’ll find yourself singing for days. The band makes musical nods to Elvis Costello, Richard Hell, The Modern Lovers, The Ramones and more. Matt Gouette is a pop virtuoso, trickster musician, and multi-instrumentalist who quite simply crafts some of the finest tracks you are likely to hear. He is comfortable in all genres it seems and his listeners are rewarded with subtle songwriting full of hooks and harmonies that linger. His work suggests equal parts Elliott Smith, Brian Wilson, and Robert Smith. Every so often we here at Tweefort actually put on a band that some might classify as “twee.” Most of the bands we book fall somewhere in the broader “indiepop” definition … or the even broader “pop” definition. However, Burlington, VT’s The Smittens have that cute, child-like quality that might plop them right smack dab in the middle of the twee spectrum. It’s not often New Haven gets a good dose of full-on tweepop, so you’re not going to want to miss this. I’ve seen The Smittens a number of times … and they always put on a great show. The Smittens are a five-piece indiepop band from Burlington, Vermont and like to think of themselves as a DIY twee pop explosion. Dana Kaplan, Colin Clary, David Zacharis, Holly Chagnon, and Max Andrucki switch up instruments, song-writing, and singing to create brilliantly lyrical and hyper-catchy pop songs of all colors, shapes and sizes. 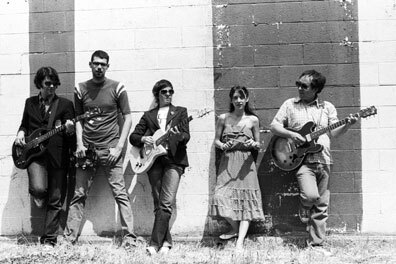 Formed on a whim at a party in 2002 by a group of popkids who wanted to make for their friends the kind of music they love, the Smittens have emerged as one of the country’s best-loved underground indiepop quintets, with headlining slots in the past year at the New England, New York, Toledo, and Athens Popfests. The bands third album The Coolest Thing About Love, mixed by Eric Masunaga, is out now, on Athens, Georgia’s indie institution Happy Happy Birthday To Me. The critically acclaimed ‘Gentlefication Now!’ and ‘A Little Revolution’ are both now available through Happy Happy Birthday to Me. The Wee Bees are New Haven’s newest pop band. The group includes ex-members of The Inclined Plane, The Caligulists and Manchester By The Sea — as well as one-half of Tweefort. The Wee Bees have an 80s- and 90s-inspired C86/shoegazey sound. 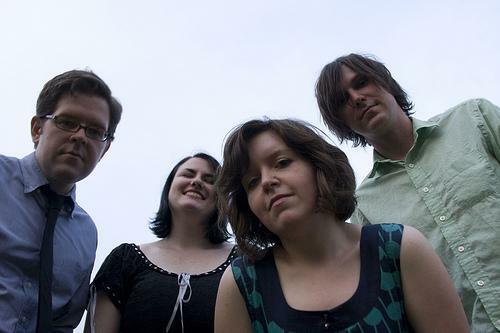 The Wee Bees are a New Haven, CT-based Indiepop band who formed in mid-2009 in cramped storage quarters along CT’s Quinnipiac River. … The Wee Bees fully embrace the DIY-aesthetic that gave birth to some of our greatest creative inspirations (C86, Sarah, K, Matador, Slumberland) and craft pop songs that span the gamut from jangly verse-chorus-verse structure to tremolo-heavy shoegaze to sweet lullabies to experimental jaunts. Plus, there’ll be the usual ArtSpace Underground entertainment, including DJ Sofia Cavallo, dancing by Sugar Magnolia and drinks by 116 Crown. 8-11 p.m. — music starts at 8 p.m.! We’re very excited to be hosting Standard Fare all the way from Sheffield UK next month. Mark March 13 on your calendar for another night of great pop music. 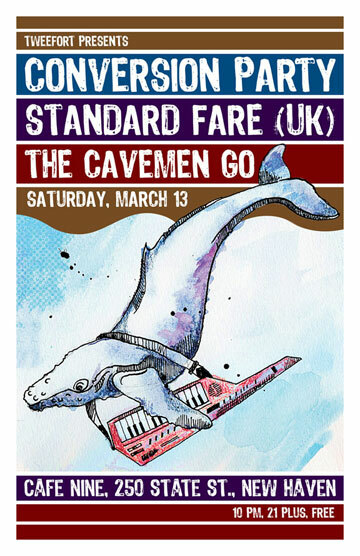 Joining Standard Fare will be New Haven’s The Cavemen Go and New London’s Conversion Party. Oddbox Blog: This new single ‘Fifteen’, again on Thee SPC, is set to lay a marker down early doors for single of 2010. ‘Fifteen’ the song, is pop perfection. Emma Kupa’s voice is one of those beguiling things – powerful, fragile and totally mesmerising and yet it still manages to be one of the catchiest songs you are likely to stumble upon, this or any year. Hiding within the grooves is a darker song about wanting someone who is under-age. Standard Fare have a sound that could loosely be described as a cross between old school British indie and US college radio indie from the 80s. That’s not to say that they sound American, the don’t. But if you were to meld together indiepop with sounds that American bands like Throwing Muses and early REM made you could well be a bit closer to fathoming how Standard Fare make sounds so deceptively simple sound so damn infectious. The B side ‘Understand’ is a gentler number and it shows that the band have more than one string to their bow. I can not wait for their début LP to be released – lucky for me (and you) that ‘The Noyelle Beat’ will be out in March. Good times. Norman Records: There’s a little buzz about this band Standard Fare. That is totally justified entirely as their debut single ‘Fifteen’ recalls classic, sprinting C86 shamble ‘n’ jangle indie, spilling with spirit & gusto. Musically it reminds me of a less twee & more muscular Heavenly or Liechtenstein’s less angular, more straight guitar pop stuff. Singer Emma has a really strong, hearty voice & the song makes me shed a nostalgic tear for beloved times listening to Peel in my teens & twenties. Really heartening to hear a band that transcends pastiche & effortlessly arrives with the equivalent of a lost gem. Piccadilly Records: Love this! “Fifteen” is a great slice of jangly indie pop that rattles along at a fair old pace and although it’s kinda cute it’s ballsy too, mainly down to singer Emma’s great vocals. “Understand” on the flip, is a slower more introspective song, that recalls Morrissey’s songwriting at it’s best. Ones to keep an eye on this year I think. Pop N Cherries Blog: While A-side “Fifteen” perfectly fulfills the role of the infectious sing-along hit, B-side “Understand” gives Emma’s voice another chance to kiss the stars on a splendid New Pornographers-like tune, full of melodic brilliance & emphasis. And check out the cute DIY video above for “Dancing” — made up of photos of the band and random photos of people dancing — it’s great. Here is the schedule for this year’s Elm City PopFest. There is the possibility more bands will be added, but this should be enough to get you excited. PopFest kick-off show @ Cafe Nine 9 p.m. Afternoon show @ ArtSpace New Haven 2 p.m.
ArtSpace Underground @ Elm City PopFest 8 p.m.
PopFest follow-up show @ Cafe Nine 9 p.m. Boy Genius will return to headline the Friday kick-off show and they’ll be joined by special guest Mr. Ray Neal of Miracle Legion. Those that saw The Geniuses and Mr. Ray play during the Steven Deal record release show caught a great set. Veronica Falls will be joining us all the way from the UK. This is their first U.S. tour and we’re proud to be their first stop. The band has a great pop/shoegaze sound and they have a recent release on the Captured Tracks label. Steven Deal will be back to tear things up with his brand of powerpop. Panda Riot and Midstates will be making a stop Saturday afternoon on their tour from Chicago. Midstates plays some great psych-influenced pop and Panda Riot should impress with their shoegaze sounds. Eula will bring the rock to the ArtSpace gallery in the early evening. The ArtSpace Underground will feature The Secret History, featuring My Favorite’s Michael Grace as well as Lisa Ronson, daughter of glam legend and Bowie-collaborator Mick Ronson. The Butterflies of Love will close out the weekend. We’re proud to have the Butterflies of Love fresh from the success of the Mark Mulcahy tribute shows. Come back Wednesday, May 26 for the debut of Tyler Trudeau side project Women’s Basketball as well as a visit from UK popsters Horowitz. There may be other special guests from overseas as well. Check the Elm City PopFest blog often between now and the pop fest for special posts on all the bands.